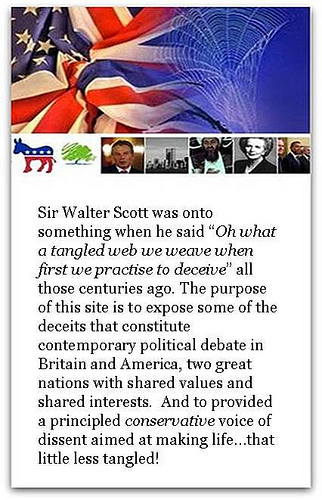 A Tangled Web » Blog Archive » HONOURING KHATAMI…. I wonder what you make of the news that former Iranian President Mohammad Khatami has received an honourary degree from St. Andrew’s University in Scotland? This BBC article fairly gushes warm praise on the erstwhile Iranian leader.. He cut a modest figure in the grey robes and black turban of a Shiite cleric. A small, bearded man, smiling at all the attention amid the gowns and mortar boards and applause in the Younger Hall at the university. I was glad to see that at least some people had the guts to protest at the award being given to this "moderate" "reformist" – as the MSM likes to think of Khatami. Here’s a quote from Khatami from 2000.. In the Qur’an, God commanded to kill the wicked and those who do not see the rights of the oppressed… If we abide by human laws, we should mobilize the whole Islamic World for a sharp confrontation with the Zionist regime… If we abide by the Qur’an, all of use should mobilize to kill." Moderate and reformist – a good guy, right? Wonder how long before Ahmadinejad gets an invite? I thought that I read sonmewhere that an arrerst warrant was being sought by some Iran Protest group, so they could get this guy placed in the slammer, and put on trial; probably for extremely bad dress sense? I emailed Ming and his minion replied today (after the event – God help us if this is how he would run a government…) claiming that (a) Ming couldn;t do anything as the university picked the bad guy and (b) he was now not going to award it himself as he was busy with the Iraq Inquiry vote in London. Well in the first place Ming could have resigned as Chancellor on a point of principle and surprised us all…..and in the second he must have been mightily relieved that the Iraq vote came up and he could use it as an excuse. What a wimp – not enough guts to resign as a matter of honour and no honour by using any old excuse not to perform the job he was elected for at St Andrews! The usual Pavlovian drippings from the jowls above. 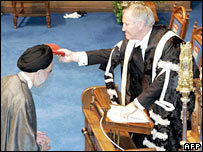 Khatami has urged British Muslims to observe British law. He has also said he understands how Britain feels threatened by Islamic extremists. i think you need to read azemehrs blog and posts properly cunningham.